Go Seigen (吳清源, Wú Qīng yuán, Wu Quan(吳泉), naturalized Japanese name Kure Izumi, 12 June 1914 - 30 November 2014), was a professional 9-dan. He is considered one of the strongest players of the 20th Century and, by many, one of the strongest players of all time. Along with Kitani Minoru he helped usher in the age of modern go with their Shin Fuseki movement. He moved to Japan in the 1920s, but remained mostly independent, occasionally acting as a guest member of both the Nihon Kiin and Kansai Kiin. He participated in a large number of sponsored challenge matches with other tops players of the day and dominated most of them. Upon retiring from competitive play, in 1983, he devoted himself to promoting "Go in the 21st Century" -- continuing to lead study groups for professionals and share his thoughts about the game, which remain highly regarded. Go was born 12 June 1914 (= lunar 19th of fifth month, 1914) in Fuzhou, Fujian Prov., China, but was moved to Beijing a few months later to join his extended family. Go Seigen started learning go at the age of nine. He excelled at the game, and by the time he was 12 years old, he was already of professional strength. Between the ages of 12 and 14, he played against a number of visiting Japanese professionals, such as Iwamoto Kaoru (6-dan), Inoue Kohei (5-dan) and Hashimoto Utaro (4-dan). He managed to win several games, causing his reputation to spread to Japan. In 1928, Go moved to Japan to start a professional career with Segoe Kensaku as his teacher. His playing strength was judged sufficient to be given the rank of 3 dan immediately. His health was frail, and he did not play in the Oteai, instead playing a number of exhibition games. In 1929, Go played against Kitani Minoru for the first time, a game which stirred some controversy because Go started on tengen and played mirror go for a long while. This upset Kitani but the two players were to become good friends and were at the forefront of a wave of changes about to sweep through Japanese go. In the early years of the Nihon Ki-in, the uchikomi ten-game match (jubango) was a popular format, though by then it had become almost a Yomiuri Shinbun patent. As komi was not yet usual, playing multiple games was the usual way to compensate for the starting advantage. Such matches used the old handicapping system of the day, and the rule was that when one player went four games ahead, the handicapping was adjusted. Sometimes the matches were abandoned as soon as this happened. 1933-34 Kitani Minoru 5d 5d 3-0-3 Started even, abandoned after Kitani was promoted to 6d; handicap not changed. 1939-40 Kitani Minoru 7d 7d 6-0-4 Started even, Kitani was beaten down to sen-ai-sen handicap after 6 games (5-0-1). 7d was the highest rank at the time, there were five 7-dans. Match covered in book, Kamakura. 1941-42 Karigane Junichi 8d 7d 4-0-1 Started even, abandoned to avoid possible embarrassment for Karigane, since one more loss would mean Karigane having to play with sen-ai-sen handicap. 1942-44 Fujisawa Kuranosuke 6d 8d 4-0-6 Started with Fujisawa playing with josen handicap; handicap not changed. Match covered in book, 9-dan Showdown. 1946-48 Hashimoto Utaro 8d 8d 6-1-3 Started even, Hashimoto was beaten down to sen-ai-sen handicap after 8 games (6-0-2). 1948-49 Iwamoto Kaoru 8d 8d 7-1-2 Started even, Iwamoto was beaten down to sen-ai-sen handicap after 6 games (5-0-1). 1949-50 A team of 6- & 7-dans 8d 8-1-1 6-dans playing with josen handicap, 7-dans playing with sen-ai-sen handicap; the loss was against Kubouchi Shuchi, the jigo against Sumino Takeshi. 1950-51 Hashimoto Utaro 9d 5-2-3 Started with Hashimoto playing with sen-ai-sen handicap, handicap not changed. 1951-52 Fujisawa Kuranosuke 9d 9d 7-2-1 Started even, Fujisawa was beaten down to sen-ai-sen handicap after 9 games (6-1-2). Fujisawa and Go were the only two 9-dans at the time. Match covered in book, 9-dan Showdown. 1952-53 Fujisawa Kuranosuke 9d 9d 5-0-1 Started with Fujisawa on sen-aisen (because he had been beaten down in the previous match), abandoned after Fujisawa was beaten down to josen handicap. Fujisawa and Go were the only two 9-dans at the time. Match covered in book, 9-dan Showdown. 1953-54 Sakata Eio 8d 9d 6-0-2 Abandoned after Sakata was beaten down from sen-ai-sen handicap to josen handicap. 1955-56 Takagawa Kaku 8d 9d 6-0-4 Started even, Takagawa was beaten down to sen-ai-sen handicap after 8 games (6-0-2). Match covered in book, Final Summit. At this point, Go had defeated all other players over a period of more than twenty years. Rather than continue with the ten-game match format, the Saikyo competition started in 1958. After three titles, the Saikyo competition was made obsolete by the Meijin Title matches. The game between Go Seigen and Honinbo Shusai to celebrate the 60th birthday of Shusai is mentioned in Magic of Go. However, the column fails to mention the controversy surrounding the match. Each player was allowed 24 hours of playing time. Over a period of 3 months, from 16 October 1933 to 29 January 1934, the game was adjourned 13 times always at Shusai's turn to play as it was Shusai's privilege to determine when adjournments would occur. As the players were allowed to go home during the adjournments, many suspect that Shusai adjourned the game at critical moments and studied the current game situation with his pupils. Though he was behind mostly during the game, Shusai made a myoshu at 160 and surged back to eventually win by two points. Later, Segoe Kensaku let it slip to a journalist, supposedly off the record, the widespread belief in top go circles that Maeda Nobuaki, one of Shusai's pupils, had discovered the move idea. It was certainly well known that Shusai did discuss the game with his pupils during the adjournments. The game was played without komi. Go Seigen played black. John Fairbairn presents a thorough analysis of this game and the surrounding situation in his book ''Old Fuseki vs New Fuseki: Honinbo Shusai plays Go Seigen'', published by Slate and Shell. 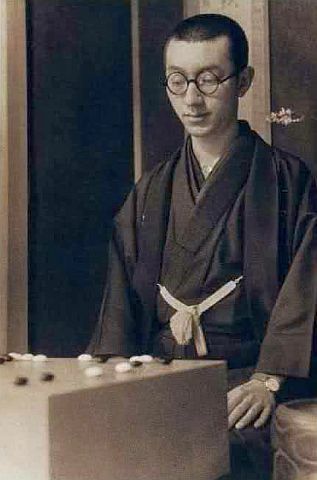 After an unfortunate collision with a motorcycle in 1961, Go Seigen gradually retired from the pro world, because when he had to play longer games he had problems with concentration. He continued to write books and holds a regular study group with today's top Japanese pros. For some of his later views on the game of Go, see Tengen fuseki. His one formal pupil was Rin Kaiho. An introduction to some of his theories about the go board can be found in instalment 12 of GoGoD's New In Go, here and also in The Go Companion. Go died of natural causes in Odawara, Kanagawa Prefecture on 30 November 2014 at the age of 100. First, he began developing a fast-paced style. From late 1933-35 he experimented with 3-3 and 4-4 openings exclusively, then from 1936-1953 he opened exclusively on the 4-4 point when playing as Black. These were all with the aim of settling the corner more quickly. Next, he began paying closer attention to who ended up with sente at the end of sequences. Finally, he began incorporating his famous predilection for contact plays with the aim of keeping the initiative. All combined, these helped him get around the board more quickly so that he could reach the big points first. Second, was the development of an amorphous style that emerged from complex infighting, contact plays, and ko fights. The end result was frequent, large exchanges/trades. After his first loss in his 1953-4 jubango against Sakata Eio, he played his opening move as Black on the 3-4 point -- the first time in nearly seventeen years. After this, he slowly integrated a wider variety of corner openings into his aforementioned style. In addition to these characteristics were: an exceptional ability at the conversion of thickness into profit; a keen positional judgement backed by accurate reading and a special intuition; and a penchant for rarely losing a ko fight that he initiated. He also regularly used much less time than his opponents. This is a collection of various thematic, career statistics, such as against certain opponents, playing as a certain color, number of games where he opened with a 4-4 point, etc. Feel free to add your own theme. *Note: over half his career played without komi. Fujisawa Hideyuki 15 5 10 0 33.3% First match 1949, last match 1973. Fujisawa Hosai 50 28 20 2 58.3% First match 1933, last match 1973. Hasegawa Akira 23 16 5 2 76.2% First match 1929, last match 1951. Hashimoto Shoji 17 12 5 0 70.6% First match 1953, last match 1976. Hashimoto Utaro 74 41 28 5 59.4% First match 1928, last match 1970. Honinbo Shusai 6 5 1 0 83.3% First match 1928, last match 1933. All handicap, but one. Iwamoto Kaoru 35 23 10 2 69.7% First match 1931, last match 1954. Kitani Minoru 82 47 31 4 60.3% First match 1929, last match 1966. Maeda Nobuaki 34 22 11 1 66.7% First match 1929, last match 1956. Onoda Chiyotaro 21 14 7 0 66.7% First match 1929, last match 1943. Rin Kaiho 7 4 3 0 57.1% First match 1952, last match 1968. Sakata Eio 43 25 17 1 59.5% First match 1934, last match 1976. Sekiyama Riichi 16 12 4 0 75.0% First match 1930, last match 1942. Shinohara Masami 24 17 3 4 80.1% First match 1928, last match 1951. Takagawa Kaku 45 27 18 2 62.8% First match 1940, last match 1972. Go Seigen has authored, co-authored, and contributed to a large number of books. However, most still remained untranslated for the Western audiences. See also: Go Seigen Books. Numerous books have been written about Go Seigen. The most famous English ones include a series of commentaries covering a part of his famous, sponsored challenge matches by John Fairbairn. 9-dan Showdown - Matches against Fujisawa Hosai. Final Summit - Matches against Takagawa Kaku. Kamakura - Matches against Kitani Minoru. The Wu family was a well-established family from Shimen (石門) town, Tongxiang (桐鄉) county, Zhejiang (浙江) Province. A 2006 movie about his life: Kisei Go Seigen. A famous rule disputes involving Go Seigen. An open book of Go Seigen commentaries: http://www.5z.com/tucsongo/book/. Books by Go Seigen: Go Seigen Books. Go and Kitani's first game and the Sixteen Soldiers game. Go was one of the primary innovators of the New Fuseki movement. Go's profile in The Magic of Go column from Yomiuri Online: http://web.archive.org/web/20070228234810/http://shinbo.free.fr/TheMagicOfGo/index.php?tmog=17. Jim Z. Yu's Go Seigen game series (HTML version by Ken Warkentyne): http://web.archive.org/web/20030605035633/http://leaohp1.epfl.ch/~warkent/go/goseigen/. Pieter Mioch's 1999 interview of Go Seigen: Part 1, Part 2 and Part 3.